Somehow over the holidays I got sucked into the black hole which is Korean drama. I don't own a television not due to any sense of superior virtue but because I know I lack self control. In this dangerous age of VOD, you can find yourself binge watching on a tablet until wee hours in the morning when the right drama catches your fancy. Imagine my surprise to see puerh being part of the plot. 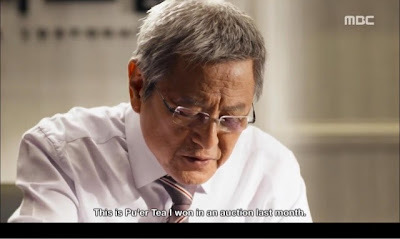 The actor below is a crooked head of a baking conglomerate calmly enjoying the puerh he won at an auction as his daughter-in-law is being arrested after he carefully framed her for fraud. The character mentions the excellent tea fragrance so it's definitely not a shu nor a wet stored wonder. 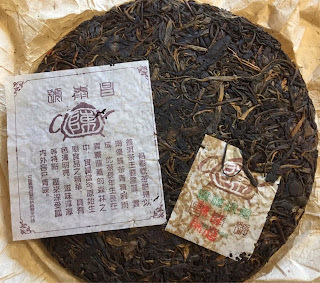 I have to ding the set designers for not brewing real tea leaves as it looked more like herbal dried citron tea than aged sheng. This MBS drama- the Legendary Witch- is a twisted tale of four women sharing a room in prison who end up starting a bakery together. When you get a mention on a major network kdrama, it means you've made it big in Korea. My mother tells me that puerh is considered a premium tea in Korea and has made a showing on other dramas being served to powerful men. Maybe there will finally be a tea based drama. Puerh and the likes of my mother's cosy tree do not quite mix where as the flavors of cinnamon and dried orange peel fit like a glove. 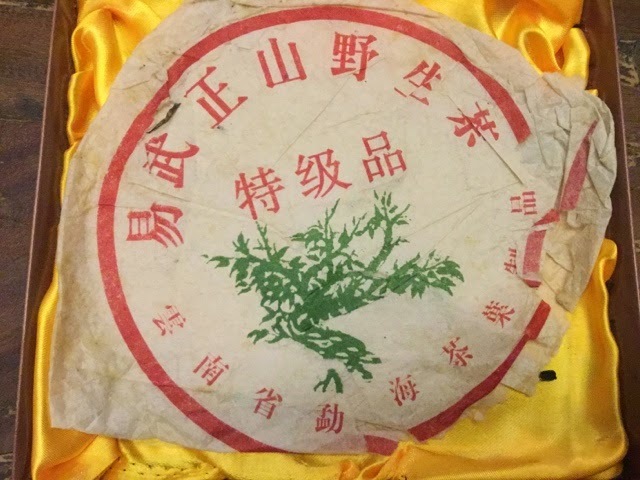 I'm not giving up just yet but I need more of a creative approach to spreading the puerh cheer and I could see medicinal benefits being the most likeliest point of entry. But medicine rarely leads to pleasure and enjoyment. Puerh is not a tea you can just push onto a family member- not enough immediate palate gratification. I thought of starting them on oolong and then easing them in. But also my parents said the fussiness of brewing looked like it was a lot of trouble. You can't win 'em all. This morning with much anticipation I brewed up various puerh for my parents as my mother innocently asked me about puerh the week previous. I had happy fantasies of being able to procure better aged sheng for my parents (and me) all under the guise of filial piety. I brought my porcelain travel kit that I use at work but everyone was amused as Koreans use such tiny cups only for hard liquor. My cups have done double duty as the occasion demands. As the wintry day was blustery, I thought I would start off with a shu. My umma and appa were quite polite but I could not get anyone to go for more than a few sips. To my absolute dismay, the first tea- a reliable 06 Dayi San Ji Pu tasted like some one had snuck a dried anchovy in my gaiwan. The municipal water here comes from the mighty Potomac that has slaked the thirst of many a president. 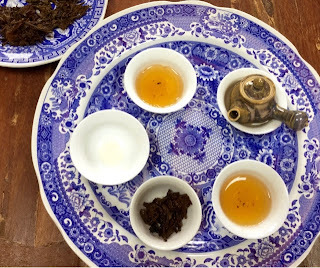 But theirs is a hard hard water not suited for puerh- all four puerhs I brewed tasted muted, vaguely muddy and flat with the '98 Yiwu suffering the most. My own Berkeley tap comes from the western slope of the Sierra Nevada with water hardness running at 18-42ppm. My parent's water clocks in at 70-120ppm- you can only imagine the calcium scale buildup inside their electric kettle. Actually taking a bath in such water is exceedingly hard on your skin and slathering oneself with body lotion is essential if you live in Virginia. I tried switching to bottled water on hand(Nestle Deer Park) which was not much better and with their hardness rating published at a wide range of 15-120ppm, it's most likely it was just as hard. Also using a carbon filtered Brita water was a bust since such drip filters do not remove much calcium. I have no choice but to go to the grocery tomorrow and look for the softer Poland Spring sourced from Maine at 10-23ppm if I am to have any decent brews this week. But the fishy notes were lost on my parents. 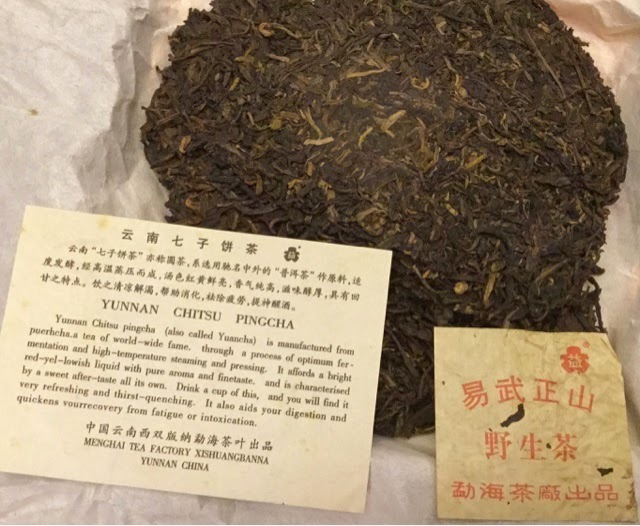 Their reaction to puerh was exactly the same as mine sixteen years ago. They said it tasted of hanyak- traditional Korean medicine- a dark bitter brew of various herbs and deer antler. I had to go straight away to chocolate tasting after the first shu to restore the holiday cheer. I used to be paranoid about the home water supply especially when I don't enjoy the teas many are praising. However I do have wonderful sessions with a small minority of teas so I deem the Berkeley water fed from the Mokolumne River blameless. But the water here makes it tough to be a puerh lover. I wonder how many drinkers have the misfortune of hard water and don't even know if they are missing out because they're used to it. You also have to use higher amounts of leaf with hard water. I'm regretful I didn't bring harsher leaf like a Dayi or XG sheng which might respond better to such water. Due to stormageddon, I'm stuck in SFO with a box of teas but no where to brew. While running around like mad yesterday gathering gifts including Japanese erasers in shape of a lobster dinner, I brewed up some aged sheng to figure out what to take on my trip. My mother has expressed some interest in trying puerh so I tried to pack the most inoffensive mild mannered teas I could muster. 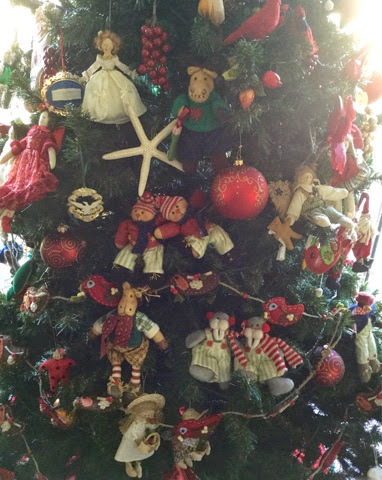 Feb. 2006, I got this Yiwu Big Tree from M&J - the first of the suspicious eBay vendors I'd burn through. When I opened the wrapper, my heart sunk- it looked like the pressing was a home job and the cake barely held together. I was such a pushover then and did not make a fuss over the fake or the XG Canger tuocha sent with a big bite taken out of it. I just never ordered from them again. The tea was not bad. It does take a good five turns to get it going. The first few brews are weak and thin but then then it turns to orange blossom and some huigan- enough to feel pleasant that you didn't waste your session. Back then I actually liked this imposter because it was one of the few I could drink. But a lightbulb did not go into my head that I should be looking for older weak teas. It tastes vaguely like Yiwu. This tea responds well to weak brewing. At $27, I could have done better back then. In today's dollars, I guess it's all good. p.s. My plan for making tea money is foiled and I lost a few thousand dollars instead. But I'm not deterred. 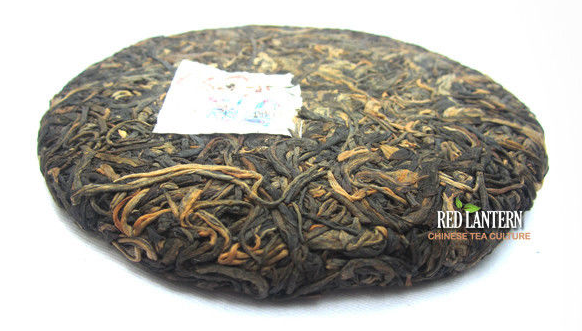 When I seek out new puerh, I'm constantly searching for a characteristic I call "lift". At it's most magical, it's a tea that will crack open the mundane weary human condition to give you a heady rush of mentally flying. But I'm happy to encounter even a thimbleful of lift which at it's most basic is just a small party in the mouth- not unlike a spoonful of brandy splashed into the jam I spread on my morning toast. I was trying my durnedest to enjoy the white tuo last week but it was just stuck in the mud - no lift... the larger leaves having too much carbon tasted overwhelmingly of graphite lead. I immediately brew up the 06 7542 and even the humble lift on this lightly fermented shu is immediately obvious- high notes add an extra lively vibrancy that makes you want to sip more. I'm going to leave this tuo a few months more to rest and if it doesn't come alive by then, I might have to put it up for adoption. So today I geared up for my weekend morning fix. Every Saturday morning I block out four hours for tea while my husband is away at class. I don't eat until I get tea satisfied. When I don't get a fix within the first two hours, I have to end with a tea that consistently provides some lift so I can eat breakfast and avoid a low blood sugar crash. A decent quality Yiwu easily provides enough lift and so I declare defeat for my five other teas and end with a 2001 Jin Chang Hao that Israel sent me. It's a lady tea that's pretty in the mouth- though not pretty enough to make grown men giggle like other younger Yiwus. But it's enough lift so I can now head to the post office and start my day. Dear Readers- this is the teacloset's 278th post. I've quadruple said anything I could possibly say on tea matters. 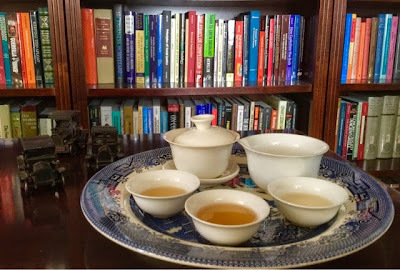 I hardly like most of the teas I encounter and readers don't read this blog to be led to better teas. I write only because we are creatures of habit and we just like the story to continue on somehow. I'm amazed that real puerh knowledge is still scant and we are still pecking around for crumbs in the dark. 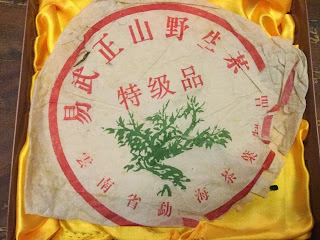 The puerh tea blogging community is in yet another state of transition with many old-time bloggers decelerating or falling silent. Hobbes and MarshalN are finally sputtering. Puerh on teachat is a ghost town, B&B is a Shah soliloquy, reddit is more of a vendor space. 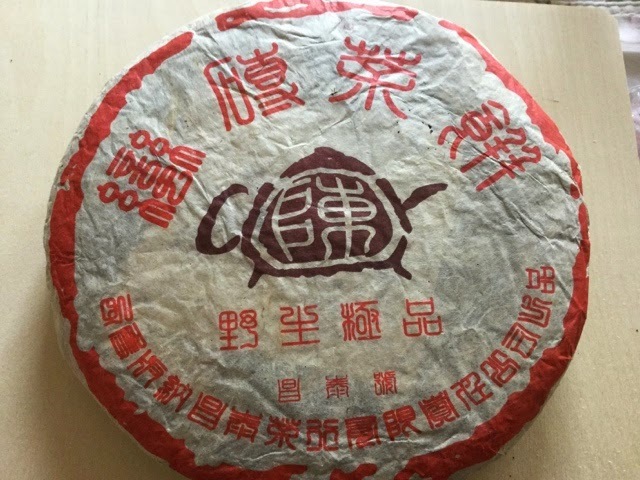 But new comers like teadb and cwyn have entered to continue on the puerh blogging line and hopefully there will always be someone holding a welcoming torch for new comers. Dry home storage - you can do damage to sheng by storing it in overly dry and cold conditions. 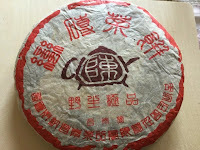 Had I tasted a few 10 year old Bay Area dry stored tea in 2006, I might not have bought newborns with such abandon. I actually did not like aged tea back then and I wanted my teas to stay young. However, the flattening out and muting of my once vibrant cakes is a sad thing to see. If you live in dry climes, youngish sheng that has been humid stored for a few years might not be a bad way to go. Pumidors in home storage - mucking about with complex humidity schemes can easily lead to unwanted mold problems. But you need not pitch teas for a bit of white mold. Second guessing yourself - our taste buds are fickle enough that you won't know what you may or may not like a few years from now much less decades from now. It's good to keep your options open. Get fewer teas of higher quality and you can always trade with others later on. Making up your own mind - there is a lot of opinions and when they form a chorus it might convince you your own instincts are mistaken. Always remember it is you drinking the tea. Mediocre tea - most of what you will buy on the internet will be quite mediocre. But just because you don't live in Asia and don't have the funds does not mean you cannot heartily enjoy this mediocre tea. Just don't overpay and don't let the tea snobs get you down. Young sheng and health - I know so many who have stomach trouble after over indulging in young sheng. Just because other people are flaunting their daily Bulang sheng intake does not mean you can too. Don't take unnecessary risks- you have only one stomach and the damage can be cumulative. I'll do a few more posts before I shutter up the boards this year. If anyone is interested in any particularly last topic from the teacloset, please post a request. No promises but I'll try my best. In another five years, I may have another blogging surge as it will be when the bulk of my cakes will putatively start to come of age. Until then, take care of yourselves and your precious tea stash.